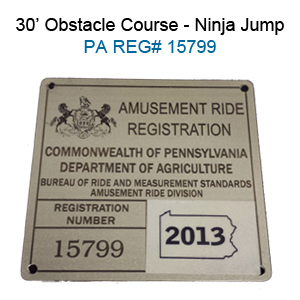 The 30′ Obstacle Course is licensed and registered in Pennsylvania. Please click here for pricing and availability. Ninja Jump’s Backyard Obstacle Challenge offers 30 feet of challenge obstacle entertainment in one unit. This inflatable play structure takes participants on a journey crawling through tunnels, maneuvering around horizontal and vertical pop-ups, with stamina-building climbing and descending along the way! This sleek, low-profile Backyard Obstacle Challenge provides a bright, primary-colored purple, yellow and red theme and its arching design will attract attendees and keep them entertained. For even bigger fun, this Backyard Obstacle Challenge also comes in an impressive 40-foot model. This inflatable obstacle course can be an amazing centerpiece for an Indoor FEC or any backyard party. The inflatable play structure begins with a front-loading obstacle entrance, taking participants through tunnels and pop-ups to facilitate maneuvering skills and build confidence. The challenge obstacle then leads to an exciting front-exiting climb and slide, all to guarantee hours of enjoyable physical activity. Each inflatable play structure has mesh windows for easy viewing, and is constructed of the fire-resistant, lite n’ strong™ vinyl for easy portability, durability and safety. The obstacle course is the perfect way to combine fun and healthy activity, and will add value to any Party Rental! With a variety of colors, shapes and themes, our moonwalks offer kids of all ages exciting aerobic activity. This jumper has 360-degree mesh windows, so parents and spectators can have a clear view of all the fun. Our moonwalks are made safe and secure with lite n strong™, fire-resistant vinyl making it safer, portable and more durable.